Fido and Friend in Five: W. Bruce Cameron and Tucker! 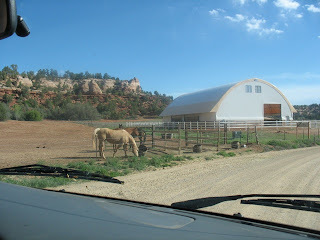 So as some of you may or may not remember from an earlier blog post, I recently went on a girls trip to Best Friends Animal Sanctuary. Not long after we got on the road, being the good librarians we are, talk quickly turned to what we were all reading. It quickly became clear that I was the only one in the car who had not read (or was reading) A Dog's Purpose, by W. Bruce Cameron. The book got rave reviews in the van. "You of all people have to read it!" everyone said. And so I did. I'm hard to impress, especially when it comes to dog stories. Let me say right now, this book is amazing. It's being compared to Marley and Me and The Art of Racing in the Rain, but personally, I think it's much better than both those books. It reminds me a great deal of my favorite dog book in the last five years, A Dog's Life: Autobiography of a Stray, by Anne. M. Martin. And let me tell you, that's high praise indeed. I normally don't like "talking dog" stories. But both Cameron and Martin pull it off with such respect for both the reader and the dog, the narration never too precious. 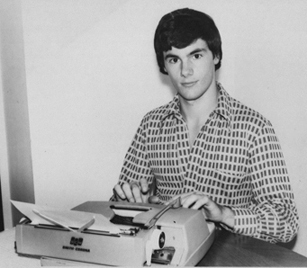 Now, you may know Cameron's early books, including the New York Times Bestseller Eight Simple Rules for Dating My Teenage Daughter. This is his first foray into fiction, and has been hugely successful. A Dog's Purpose spent 19 weeks on the New York Times Best Seller List, and has just come out in paperback. And the movie rights have sold! Hooray! Bruce also has a new novel, Emory's Gift, coming out in August. AND he's a syndicated columnists, so I was really surprised and thankful when he enthusiastically agreed to visit my funny little blog with his cuter-than-cute friend, Tucker. 1. How did you and Tucker meet each other? My dog Tucker was abandoned at birth--dropped off in a box at my daughter's animal rescue. She took him in to her home, where she has about ten thousand pounds worth of dogs. He was so well socialized that my daughter said, "Dad, I know you're ready for a new dog. This is the one." 2. What' your all-time favorite dog story? You're kidding, right? It's A Dog's Purpose. 3. What makes Tucker's tail wag? Saying his name, or thinking his name, or looking at him or in his direction, or at anything at all. 4. If Tucker could change just one thing about you, what would it be? My fingers would be made of bacon. 5. In five words, tell us what Tucker means to you: More than just five words. Thanks so much Bruce and Tucker! Sometimes it's easy to get all caught up in advances, reviews, royalty statements--the business end of being a writer. We forget why we love writing for kids in the first place. 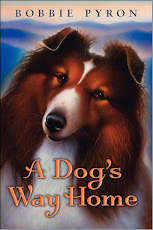 I read A Dog's Way Home to my 8 year old daughter a few chapters at a time as a bedtime book. We really enjoyed reading and experiencing it together. We regularly read chapter books at bed time, and yours was one of the best ones we have read. My daughter couldn't wait until it was my turn to put her to bed to find out what was happening with Abby and Tam (my wife and I take turns, and we each have our own books that we read with her). My daughter, Mia, wanted to write to you as well. The next paragraph is from her. I liked Cheyenne. I liked that at first she seemed mean, then it turned out she was really nice. I like that at the ending she gave Abby a ride in her limo to get to Tam. I also thought the baby coyote (the one that traveled with Tam) was cute. I was sad when she got shot. I want to recommend this book to a lot of people. I recommended it to my assistant teacher and I told her that if she liked the book then she should tell my other teacher to read it. It is probably so far the best book I have read in my entire life. Have you memorized the book by heart? Also, where did you get the idea of the book? Are you going to write any more books about Abby and Tam and make a series? Again, we really enjoyed reading this and we wanted to you to know how we felt. Looking forward to your next book! No, thank you, Mia and Dad, for reminding me why I write. PMS Gang at Best Friends! No, not that kind of PMS! I have a group of friends here in Northern Utah. We all have two things in common: 1) we all work for the Salt Lake County Library system and 2) we all have shelties adopted from Sheltie Rescue of Utah www.sheltierescueut.org Thus, we are all Proud Moms of Shelties--otherwise known as The PMS Gang. We try to get together several times a year with our dogs, and from time to time, without them. 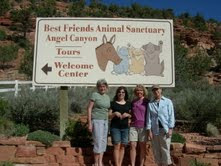 A few months back, when we all had dinner together, we were talking about Best Friends Animal Sanctuary down in Kanab, Utah. Some of us had been there before and some hadn't. So I said, "Let's all go down there in the spring and volunteer!" And so we did, last weekend! 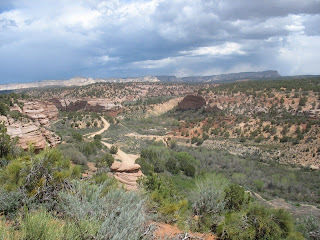 The four of us said goodbye to our own rescued dogs (and husbands), piled into Dena's van, and headed down to beautiful Kanab with far too much food. Yours truly was a little nervous, what with it being Friday the 13th and all, but we got there just fine. Saturday morning, we headed to Angel Canyon to Best Friends. 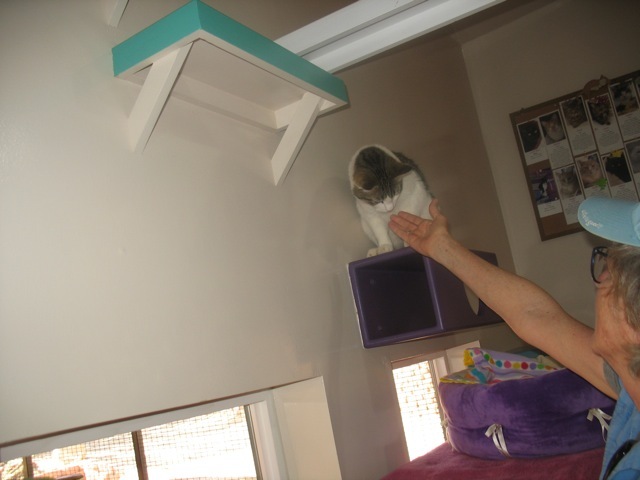 If you don't know about Best Friends, it's the largest no-kill sanctuary in the United States. The organization owns thousands of acres there in the canyon. 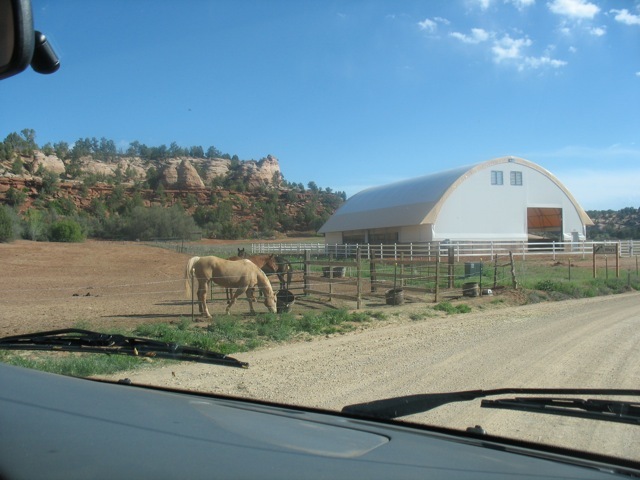 At any given time, the sanctuary houses and cares for (in the most compassionate, positive ways possible) around 1500 animals--dogs, cats, horses, pigs, birds, rabbits, you name it! Thousands of people come there every year from all over the world to volunteer. Anyway, we went on a wonderful tour of the sanctuary. I've been on that tour probably close to a half dozen times and I never get tired of it! And I never get tired of seeing people's reaction to the sanctuary who've never been there. After the tour, we ate lunch and then headed to our volunteer duties. You may be shocked to know that often when I go there, I choose to volunteer at the Cat Houses, seeing as how I'm such an avowed dog person. 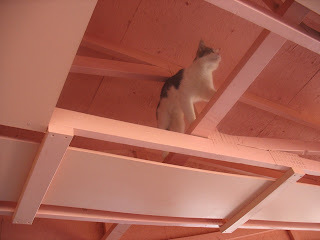 But I do have cats too, and I love helping out with the cats there. We played with the cats, brushed the cats, and Linda even took a very special cat for a walk on a leash! Or rather, he took her for a walk. We all decided that walking cats bares no resemblance to walking a dog. No matter how many times I volunteer there, I can never get over how clean everything is! The indoor and (screened) outdoor areas for the cats are scrubbed down twice a day. And you can't believe all the "enrichment" activities they have for these cats. I don't dare tell my cats about Best Friends. They'd be hitchin' a ride down there in a New York minute if I did. Our time was, of course, too short at Best Friends. We plan to go back for a longer time in the fall. And if they're lucky, maybe we'll take our husbands along. There's nothing better than being at Best Friends with Friends! 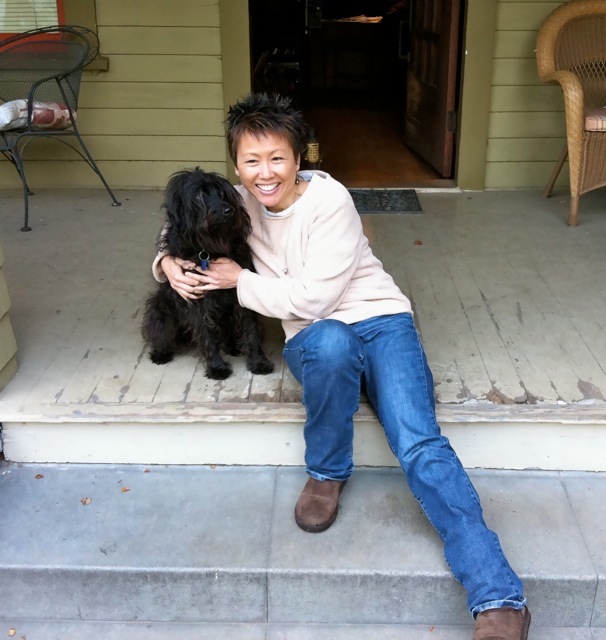 Fido and Friend in Five: Lisa Yee and Maggie! 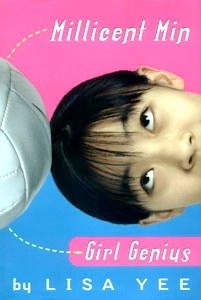 When I first started writing longer fiction (longer than picture books, that is), someone recommended I read Millicent Min Girl Genius, by Lisa Yee. 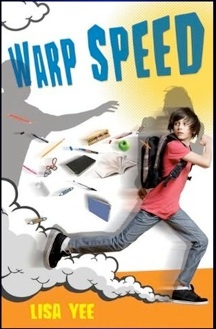 This person told me it was the best book I could read to understand character-driven, almost perfectly written middle grade fiction. "The voice is perfect!" she said. "The pacing is perfect!" she said. I read it, and she was right. Ever since then, I have studied Lisa's work to see how she works her magic. 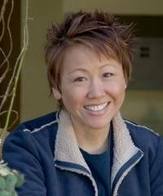 Her multi-award winning books are funny, heartfelt, and handle "heavy" topics with her trademark compassionate, light touch. So I was thrilled when I found out that the amazing Lisa Yee and I have two things in common: 1) we both will soon have the same editor, Arthur A. Levine. Lisa has been working with The Arthur for many years; I'll be working with him soon on my new book, Mercy's Bone, and 2) we both love dogs! 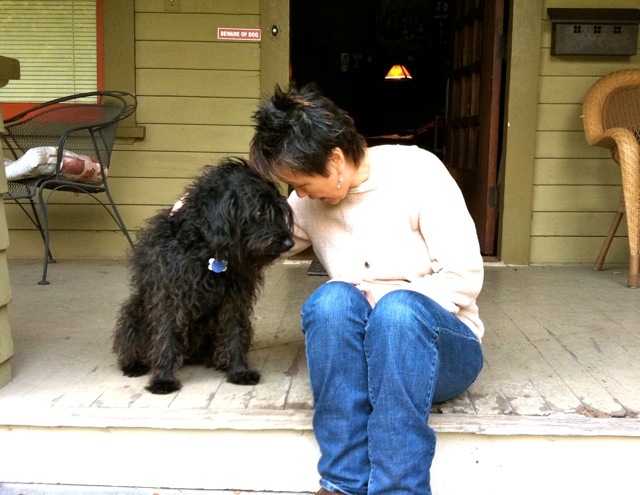 Lisa and her husband and two kids share their home with Maggie. Let's meet them both in their Fido and Friend spotlight! 1. How did you and Maggie find each other? Everyone in my family is allergic to fur, but we always wanted a dog. Then one day, I saw the cover of LIFE magazine and it read, "The Perfect Dog? 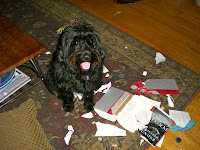 "Inside it raved about "Doodle" dogs: Labradoodles, Goldendoodles, etc. They don't shed (that's the "oodle" poodle part of them), and the first Labradoodles were seeing eye dogs for blind people with allergies. So I researched, found a breeder in my state, and got on a waiting list. Five years ago Maggie, our miniature Labradoodle, joined our family! 2. What makes Maggie's tail wag? Oh man, say the word "Outside" and you'd think someone had just dumped a truckload of fresh chew toys on the lawn. Maggie sinks her teeth into a good book! 3. What's your all-time favorite dog book? Maggie is particularly fond of The Perfect Storm. Oh, wait! I read that question wrong! My favorite dog book is probably Beverly Cleary's Henry Huggins. I love it when Henry meets Ribsy and will do anything to keep that dog. 4. If Maggie could change just one thing about you, what would it be? Hmmmm....let me ask. 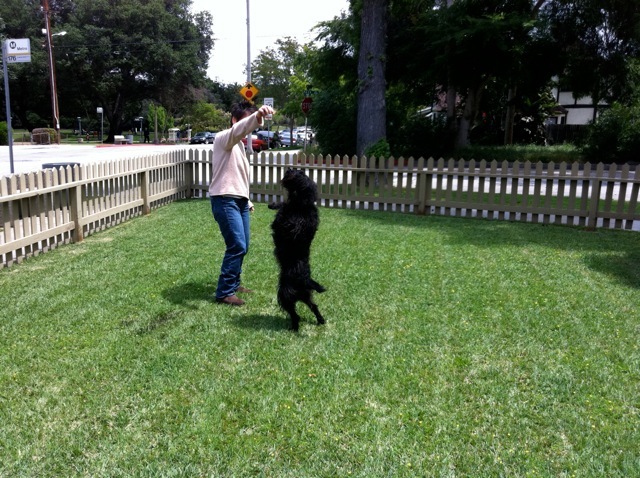 Maggie says that I need to take more breaks when I'm writing to play with her. Inevitably, right when I'm about to have a writing epiphany, she'll come into my office and start nuzzling me until I get up and go OUTSIDE with her. 5. In five words, tell us what Maggie means to you: Total unconditional love (both ways). I thought about how many so-called "handicapped" dogs I know who have no idea their lives are supposed to be so much worse off because they're blind or deaf (or in Tommy's case, both!) or are missing a leg. They wouldn't know the first thing about self pity. They are too busy engaging in the world and living their lives. Take for instance my friend Chloe and her person, Susan. Chloe was picked up running the streets of Sandy, Utah by animal control. 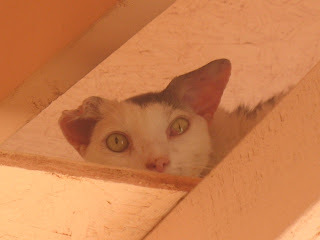 She was terrified of people and in bad physical condition. 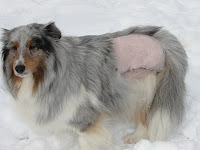 Fortunately for Chloe, Sheltie Rescue of Utah www.sheltierescueut.org heard about this gorgeous sheltie's plight and took her into their program. A thorough examination revealed Chloe had a back leg that had been badly broken and never treated. Her only option was to amputate the leg. Not long after her surgery, I told my good and big-hearted friend, Susan, about Chloe. 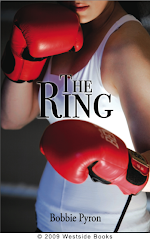 A cancer survivor, Chloe's story of survival resonated with Susan. When they met, it was love at first sight. Now, after several years together, Chloe and Susan are a certified therapy team, inspiring others with their stories and kindness. And then there's Tommy. Tommy is a sheltie who was born blind and deaf because of irresponsible breeding. He also found refuge with Sheltie Rescue of Utah www.sheltierescueut.org. He loves to play with the other shelties in the household and has traveled all over the place. He even came to my book launch event at The King's English in March! He was quite a hit with everyone and thoroughly enjoyed the attention! Don't feel sorry for Tommy. He's happy and loving and full of curiosity and kindness. Oh, and did I mention he's also available for adoption? He'd make a great therapy dog, just like Chloe. So this is just one of so many ways animals inspire me. How do they inspire you? 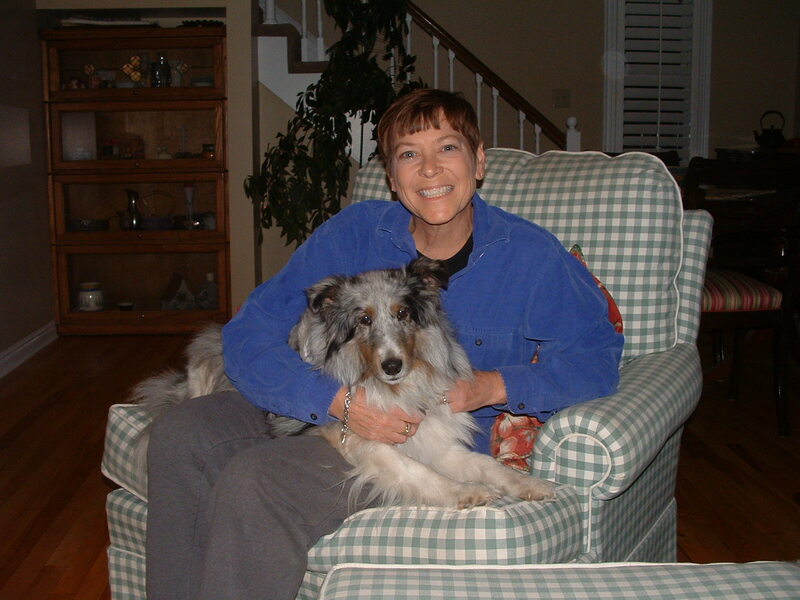 Fido and Friend in Five: Kathy Nuzum and her pack! Kathy's book, The Leanin' Dog, grabbed me from the cover as soon as it came in to the library where I work. The face was a hound-looking dog with soulful eyes starring out at me. I knew exactly how those ears would feel rubbed between my fingers: velvet. 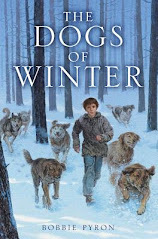 So of course, given the cover and the word "dog" in the title, I had to read the book right away. And it did not disappoint! 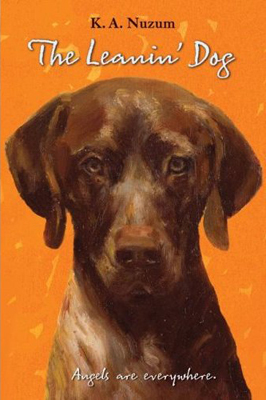 The Leanin' Dog is a gorgeous, heartfelt, heartbreaking, and heart-lifting story about how angels can appear even in brown, hound-dog disguises. 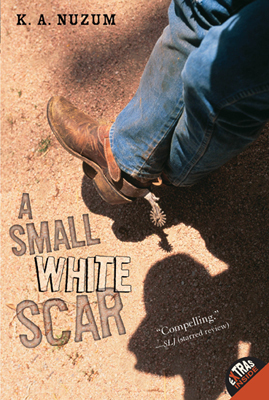 Kathy is also the author of the teen novel, A Small White Scar, another powerful novel about the invisible things that bind us. Both books of Kathy's are multi-award winners. 1. How did you and your dogs find each other? 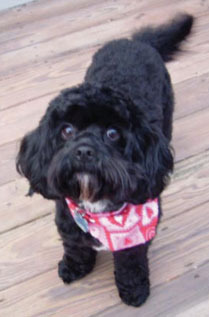 Well, from my oldest to youngest: Elizabeth the shih tzu' my husband went hunting for because our youngest son wanted a dog that would always stay small enough to cuddle. The Christmas Puppies, Merlin the schnauzer and Toto the cairn terrier were a Christmas present mix-up (my husband was planning to surprise me with Toto at the same time I was adopting Merlin--oy!) Kiwi, the Australian herding dog was dumped on a road in Utah, sent to our local shelter, and badly needed a home. Our latest addition, Ripple the hound had an unhappy childhood with an abusive, alcoholic drifter. She landed at a friend's house, but couldn't stay, so she came to us. We are a perfect example of the line from "Field of Dreams": If you build it, they will come. Except we would paraphrase to, "if you have the heart and room, dogs will come." 2. What makes your dogs' tails wag? Just about everything! Mealtime, walk time, cuddle time, and last but not least, CATS (we have three). 4. If your dogs could all change just one thing about you, what would it be? 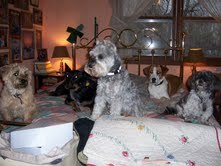 They would all want me to bark instead trying to get them to quit. 5. In five words, tell us what your dogs mean to you: Communion, safety, adventure, comfort, mindfulness. 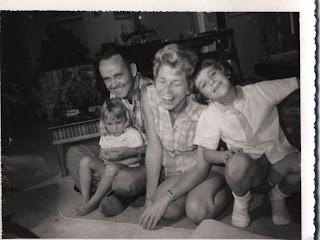 Mother's Day is bitter-sweet for me: my mother died about fifteen years ago just after her 65th birthday. In this way (not having a mother on Mothers Day), I think Mothers Day is bitter-sweet for many of us. I have a couple of "motherless" friends. We used to get together every Mothers Day for brunch to remember our mothers. We haven't done that in a long time--we've all remarried, some have had grandchildren, in other words, we've gotten busy. None of us, though, had perfect mothers. None of us had June Cleaver type mothers, or Hallmark Card relationships with our moms. The relationships were as complicated as we were and our mothers too. But we all missed our mothers every day. I love this picture with my mother in it. I look at it most every day. The reason I love it is because my mom looks so happy in it. She looks silly, almost giddy. There I am, all huddled in my father's lap. Can't tell if I'm being shy or pouty. Probably both. But my mother and my sister look happy as clams. I think I'm four in this picture. Within two and a half years, my father would be dead and I would never see my mother this giddy again. She had a tough life after Daddy died, but she did her best. She was not a cuddly kind of mother. She was not the type to join the PTA. She was not the type to tell her daughters, "You can be anything you want if you try hard enough." Maybe if the love of her life hadn't been killed by a drunk driver and left her with two young daughters to raise, she would have been "that type." But maybe not. But she did teach me to walk a mile in other people's shoes before I judged them. She taught me to be self-reliant and to not suffer fools lightly. She taught me to take care of myself financially because you never know what life will throw at you. And towards the end of her life, she taught me not to whine and ask, "Why me," but rather to ask, "How can I live this life I've been given with grace?" And in the end, maybe what she did teach me is worth a bucket load more than all the PTA cupcakes and gooey sentiments. So happy Mothers Day, Mama. I miss you every day. And happy Mother's Day to all of you who are "motherless" on this day too. Fido and Friend in Five: Quincy and Moira Donohue! One of the many things I've enjoyed about doing this blog is the enthusiastic leads the authors have provided to other dog-loving authors. When I talked with Kathryn Erskine about her F&F spotlight, she said, "Oh, you need to get in touch with my friend Moira Donohue. She LOVES dogs!" And so I did. And she does! 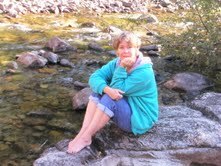 Moira also loves words and working with words and teaching kids to love and respect words too. On her website www.moirarosedonohue.net, she describes herself as a writer, playwright, and a "grammar and punctuation geek." Moira is also proud dog mother to the incredibly cute Quincy. 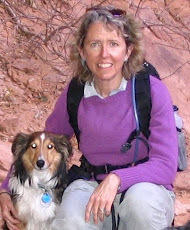 She also shares with us a personal story about a very special Irish Setter. 1. How did you and Quincy find each other? I found Quincy through an online consortium that breeds "hybrids." 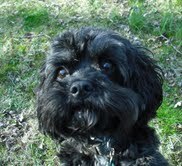 He's a Cavapoo--half Cavalier King Charles Spaniel, half poodle. 2. What makes Quincy's tail wag? Morning. Bedtime. Toys. Food. Walks. Actually, just about everything! But the most charming wag is when he's laying down and you walk in the room, and that splendid plume starts thumping on the floor. Isn't it time for a walk? 3. What's your all-time favorite dog story? Well, I've always loved The Incredible Journey. My favorite personal story is about my Irish Setter, Shannon, long departed for the great meadow in the sky. When my son (now graduated from college) was a toddler, he was a biter. he would spy Shannon sprawled on the sofa and shakily approach her. He would then chomp down on her flank and back up with her skin in his mouth. The dogs would simply look at him, and never utter a sound or protest in any way. What a sweetheart she was! 4. If Quincy could change just one thing about you, what would that be? I would walk him every hour. 5. In five words, tell us what Quincy means to you: Unconditional, unquestioning, unwavering, unfailing love.